The Outlook Email Gadget is a free add-in available to supported Outlook email clients. Once you have finished installing it, you will find Method's Outlook Email Gadget in the header of the email when you expand an email. This is important, the Method icon will not show up until you expand the email to see the body and the text. If you click on the Method icon, it will open a panel on the right to give you access to the data within the Method account you are signed into. If you are not signed in to Method, you will be required to sign in via the Outlook Email Gadget itself. Name | Search | New - The Search link allows you to search through your existing contacts and display their information. 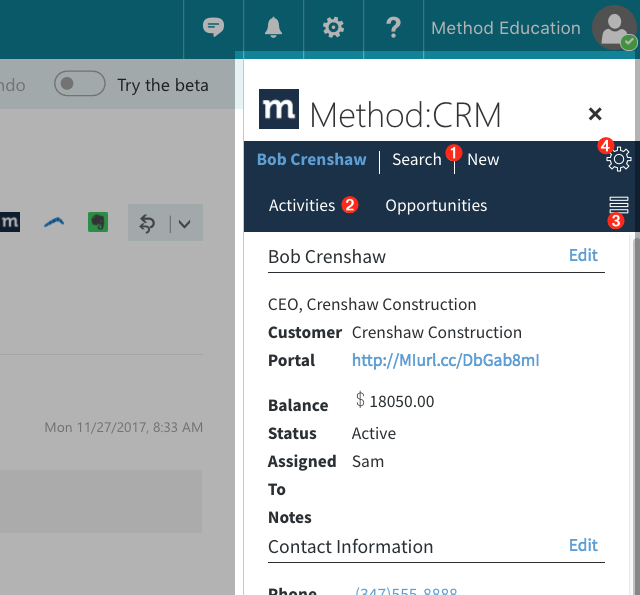 The New link will let you create a brand new contact. Selecting the name displayed will bring up the contact information for the named contact. 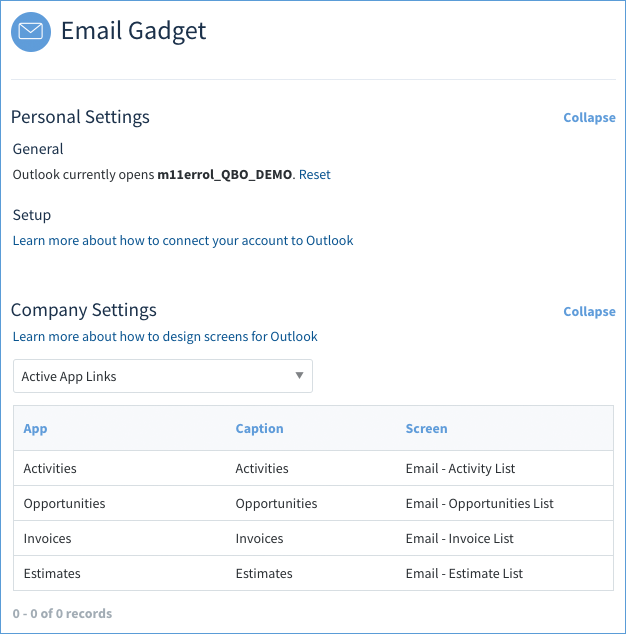 Active App Links - This line lists the active apps available within the Outlook Email Gadget. The gadget will switch to the appropriate screen when an app is selected. More Apps Menu - If there are more apps available that can't be listed within the gadget, they will be selectable from this menu. Preferences - Selecting the gear will bring up a menu. The first is the Preferences link which will take you to the preferences for the Outlook Email Gadget within your Method account. The second link refreshes the gadget. The final link will sign you out of the gadget. 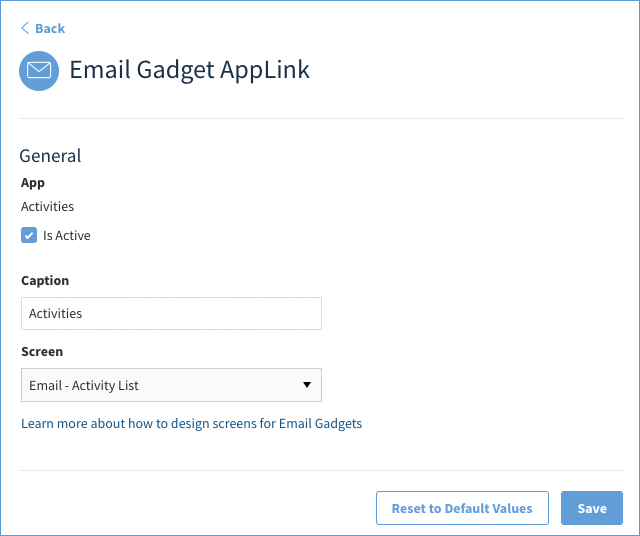 To get to the preferences, you must select the gear within the Outlook Email Gadget itself, and choose Preferences, this will take you to the Outlook Email Gadget Preferences within your Method Account. The personal settings of the preferences deal with your connection of the Outlook Email Gadget to Method. General - You can see which account the Outlook Email Gadget opens to. This is handy if you have multiple Method accounts and want the gadget to default to a particular account. You can reset or disconnect the connection with Reset (see below). Setup - To learn more about how to connect your account, you can click the link to be taken to our Help Center article on installing the Outlook Email Gadget. Reset link to Account - This is useful if you have multiple Method accounts and you want the gadget to link to a different account. Disconnect from Microsoft - This disconnects Method from Microsoft. If you wish to reconnect, you will need to enter your sign in credentials before associating your email gadget to your Method Account. The company settings allow you to set up which apps appear within the email gadget. By selecting an app in the grid, you can configure it. In the below example, we are looking at the App Link for the Activities App. App - The app which is being configured for the Outlook Email Gadget. Is Active - When checked, this app will be shown in the gadget. Caption - The name displayed within the gadget. Screen - The screen that is shown within the gadget. This screen must exist within the associated app, e.g. you cannot show a screen from the Contacts App within the Activities Applink. Also, the screens are completely customizable so you can customize how the Outlook Email Gadget looks and performs.